I remember my mom dressing me in OshKosh B’Gosh overalls when I was younger. Touted as the “World’s Best Overalls,” they were passed down to my sister, then my little cousins. That’s how durable they were. Their quality and value is unmatched, and they never go out of style! Over the weekend, on our way to New Jersey to visit family, we stopped at an OshKosh B’gosh outlet store and I let the girls go on a little shopping spree… $100 to buy whatever they wanted! While OshKosh continues to sell the adorable overalls they’re known for, the brand has so much more to offer!. My girls have very different styles. Maya is all about comfort – jeans, t-shirts, sweatshirts, and sneakers. Maura, on the other hand, is super girly and lives in dresses and anything pink. OshKosh B’gosh has everything they like and more! The only thing I’m sad about is that Maya is already at the biggest size – 12 – so she won’t be able to wear their clothes much longer. Booo. Why do they grow so fast? From the moment we stepped in the door, the girls were oohing and ahhing at all the colorful clothing! Maya found the perfect pair of skinny jeans. Super comfy, with just a little bit of stretch. She paired those with a tunic and a couple of winter-themed shirts. 3 outfits right there. BOOM. The hand-drawn tees, like this snow princess one, are great and only $6-7 each! There was also a big display of pullover fleece ‘cozies’ by the door, and she couldn’t resist getting one of those, too. Maura spied this pink polka dot dress and had to have it, along with the matching cardigan. This girl is a toothpick, so even though it’s technically her size, it’s a tiny bit big, but she’ll grow into it, and it can be cinched at the waist. A pair of hot pink suede sparkle boots and a set of hair clips completed the look! She also got a couple of tees, too. I asked Maya what her favorite purchase was, and she said the skinny jeans, by far. She told me they’re the best fitting jeans she’s had in a long time! Maura’s favorite were the boots. i don’t think she’s taken them off since! “They’re soooo soft, mommy. Soooo warm! Sooo pink!” And so on. We were able to purchase 10 items with a $100 gift card, including those boots… so I’d say our shopping spree was a big success! And because I get everyone in the family new PJs every Christmas, I just couldn’t resist running back into the store to buy a couple more things while the girls went off and grabbed a snack with their dad nearby. The styles are precious, and they’re ‘buy one, get one free’ right now! OshKosh B’gosh has some great sales going on! 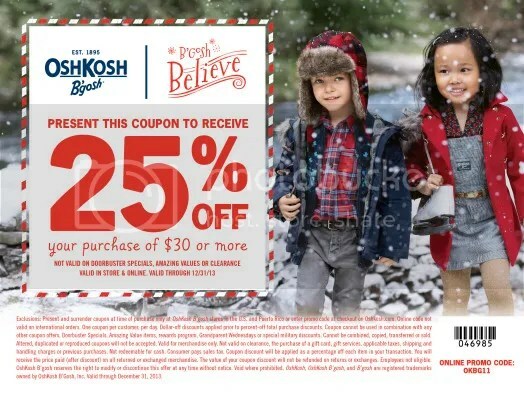 For an additional 25% off your purchase of $30 or more, be sure to print this OshKosh B’gosh coupon below. It can also be used online at www.oshkosh.com. Plus, you’ll earn one $10 B’gosh Reward for every $50 spent! I use to love this store when my kids was little. They lasted for a long time so they was totally worth the investment. Those red and white striped overalls at the top of your post are CUTE!! Oh my gosh….I remember having those overalls when my girls were little!! Your girls are adorable and have a great sense of style!! Love this store and their prices!!! I’m looking for some Christmas pjs for my boys and I love the selection at OshKosh. Love those pink boots! That Dog patterned tunic is really cute too! Looks like your girls had a lot of fun. I LOVE Osh Kosh so much! Their quality, and prices cannot be beat! We love OshKosh. They have great stuff! 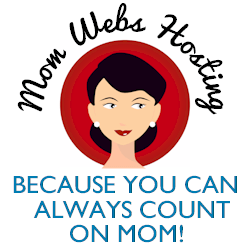 Francine @ Teresa’s Family Cleaning´s last blog post ..Save Yourself From Decoration Disasters! very cute selections, my mom used to dress me in this brand as a kid. So many cute clothes…I really need to go shopping for my kids. Oh such cute stuff! I adore that pink polka dotted dress! Adorable! those overalls bring back SO MANY memories!! love it! OshKosh is one of the best loved brands because they provide such a good quality product. Love everything you got! We just went there over the weekend and my daughter wanted those pink boots SO BAD but they didn’t have her size. We ended up getting black ones. The sale was amazing! Best. Boots. Ever. Think they make them in my size? the have the cutest kid clothes! loved those boots! Love Oshkosh. We have been big fans of Oshkosh for year and it looks like we still got a couple more years left. Loving the coupon! going to use it this weekend to get some Christmas pajamas for the monkeys. These are soooo cute! I think Osh Kosh is the best quality – I always used to buy it when my nephew was little and we lived close to the outlet!